Last fall/winter, my step-daughter suddenly had an interest in sewing and we started making dresses together. After sewing a few to her liking, she said she wanted to sew another this spring and chose this fabric from my stash. For a moment, I had a bit of panic because this vintage knit was one of my favorites and though I try not be selfish or possessive (especially with my kid!)... it was a challenging moment. 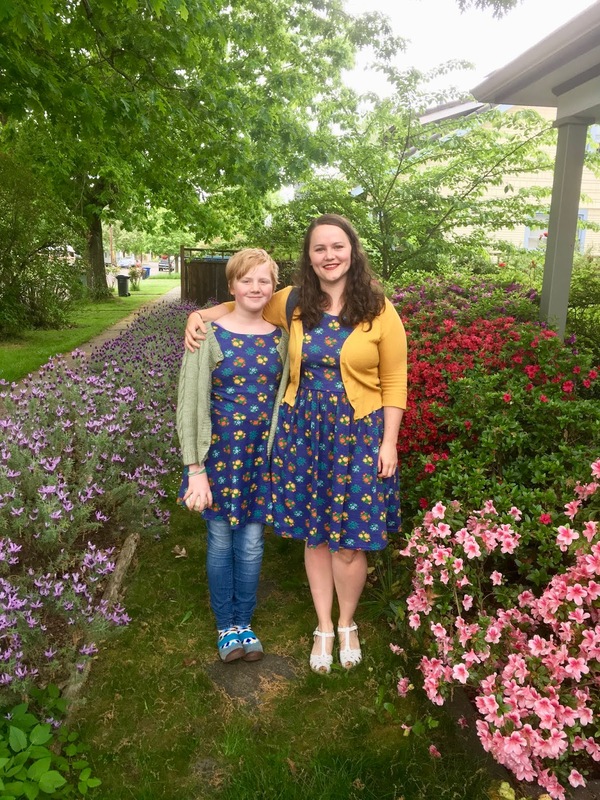 I suggested we make matching dresses, and with careful cutting we were able to make it happen. The back bodice of my dress has a seam down the middle, at center back. When we sew sleeveless Moneta dresses (pattern by Colette Patterns), she is able to do most of it herself. I've tried to be strategic in easing her in to the more difficult aspects, but two things she hasn't tried yet: clean finish on the lined, sleeveless bodice (pictured above), and insert elastic. So, in our partnership, I do those two things if they are required, and I let/encourage her do the rest. Often, when I hem knit dresses, I don't bother pressing because I can feel the fold and keep the hem width relatively consistent just be feel. To have an easier time with the hemming, I have pressed the hem up for her in the past. This time, I asked her to press up a 1" hem, and she did a great job. The rest of the sewing was relatively easy for her. She practiced pinning things in place, using the serger at a careful speed to allow herself time to remove the pins, and keeping the stitching of her hem at a consistent place by aligning her fabric with the hem-width lines on my Bernina 1008. To hem this dress, I set up the Bernina with wooly nylon in the bobbin, and a twin needle on top. I had to drop the top tension very, very low, though I think this might be a limitation on my machine. I've found sewing with the kid to be rewarding and fun, though sometimes challenging. If she's not in a detailed mood then she'll get sloppy and cut corners, which results in obvious issues (likely only catching one piece of fabric when serging, because she didn't line up her fabric for the seams). This is to be expected, and I think we just need to gauge her interest and jump in when the time is right. Last weekend, we were finishing a sewing project together (matching dresses for her and her sister's birthdays), and she just didn't seem interested. She kept walking away, and I had to keep asking her if she wanted to do the sewing or if she wanted me to do it. Eventually, she asked, 'Do you ever think you want to do something and you like it, but then you don't want to do it anymore'? We talked about how sometimes our interests come and go, and she said she was having fun sewing but doesn't want to do anymore right now. I shared that it happens to me a lot, and there is no pressure for her to sew and that I only want her to sew if she's enjoying it-- but that we should finish the things we start. She helped finish that project, and then went to play elsewhere. Learning life lessons in the sewing room-- a good thing, eh?